At Remerge, we have an in-house team of expert designers to help you craft creatives for every stage of your campaign. 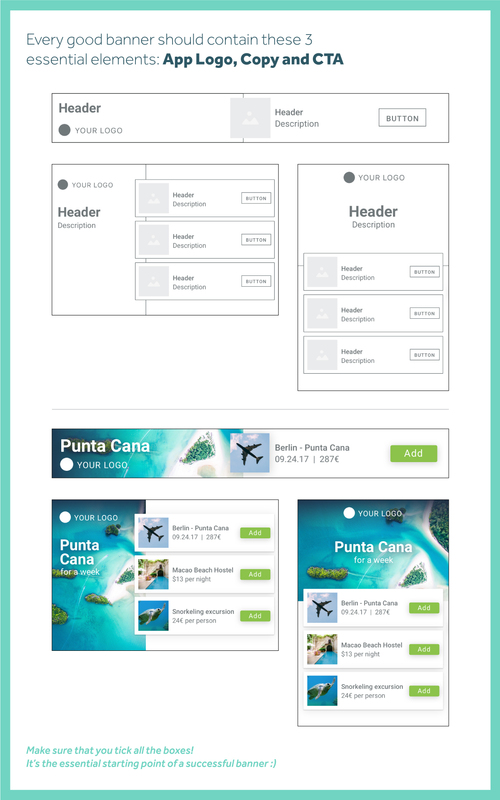 In this blog post one of our top designers, Lucas Sesboüé, gives a rundown of how to optimise the design of a retargeting banner for the best possible results. There’s a lot of things you need to bear in mind when designing a successful retargeting banner, but luckily for you we’ve boiled it down to 5 key points. Let’s get started! 1. First thing’s first : the app banner’s essential checklist. Make sure that you tick all the boxes! It’s the essential starting point of a successful banner. So your design studio just provided you with a sleek set of User Acquisition banners, why not just switch the « install now » button to « open app » and launch that campaign fast? I know, it’s tempting. However, effective banner design is not only about the CTA, but it’s also the copy, the images, and the colors used that make the overall concept of it. 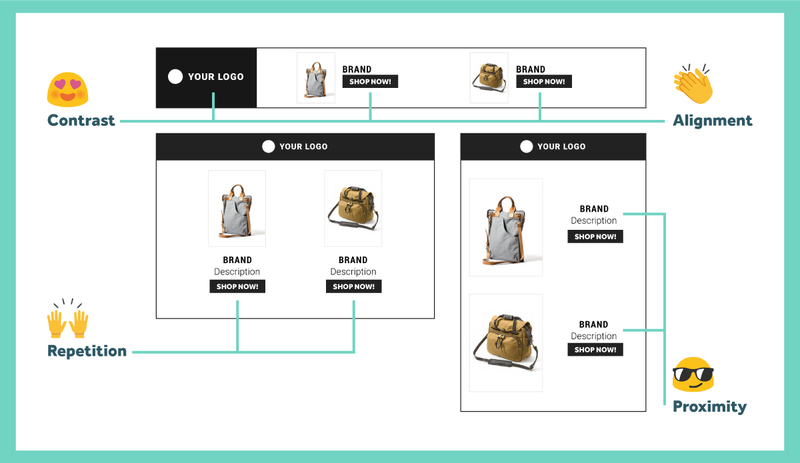 The UA concept won’t always work for retargeting purposes, even with an updated CTA. Why is that? UA banners are designed to gain your user’s attention for the first time, with the goal of triggering an install. Retargeting banners on the other hand, should be about your user’s intent. What will drive them to come back into your app to complete a tutorial, a purchase, or a level? Definitely not a generic banner design. When done right, app retargeting can offer a really granular segmentation of your user base , so take advantage of this! Try to have a personalized message for each type of audience. This can highly increase the performance of a banner. Contrast: Give contrasting properties to the elements of your design, so they don’t get confused for each other. Contrast colors, shapes and fonts! Contrast can be applied on your CTA button, by selecting a color that really pops out. Repetition: While contrast makes an element stand out, repetition balances this and structures the overall banner. Be consistent in the way you display elements of the same level. Example: If you display two products on your banner, each product title should have the same fonts/colors/size. Alignment: No element of your banner should be placed randomly or arbitrarily. Aligning them properly will increase readability and make your design more coherent. Proximity: Group relevant informations together, and give space between the groups. White space is important, you don’t want to clutter your design. If you can afford to entice your user’s way back into your app with a promotion, by all means do it! Discounts, free items, temporary plan upgrade, etc. These can really help the decision of coming back to your app.